What follows is designed for newer businesses. If you’re a Frazer veteran, your Start Accounting process will be different. Click here for the Accounting Setup for Frazer Veterans. Follow the instructions below for a detailed, step-by-step process that will help you learn Frazer Accounting. To start, you need identify how you pay for things at the dealership, and then add those things into Frazer the proper way. Then you need to clean up anything you've already entered incorrectly. Watch the video tutorials on this playlist : Starting Accounting for New Dealers. These tutorials outline the basic day-to-day operations in Frazer and how they affect your Accounting. Use these videos to get familiar with the things you'll need to focus on. These video tutorials are at the bottom of this page as well. Feel free to call us at 888-963-5369 with questions! Since you're brand new to Frazer and you've recently opened your dealership, your Accounting Start Date is the day you opened. As you use Frazer, your G/L account balances will set themselves. All you need to do is learn how Frazer handles accounting. Identify and get familiar with the G/L Accounts that are defaulted to pay for things in Frazer. We have set the majority of them for you : See Frazer's Internal Chart of Accounts, here. We're going to focus on 3 of the main accounts you use when adding vehicles, added costs, and floor planning those vehicles. *Important : The next step is only useful if you have existing data in the Frazer software. If you do not have vehicles or customers in Frazer, you can skip this step, and continue to step 5. You’ll need to print 2 total reports and verify the data on them. You may need to correct some of your data if it was entered incorrectly. A. Print a List of Vehicles Purchased. Click Reports > 1. Vehicle Inventory Reports > 3. List of Vehicles Purchased. 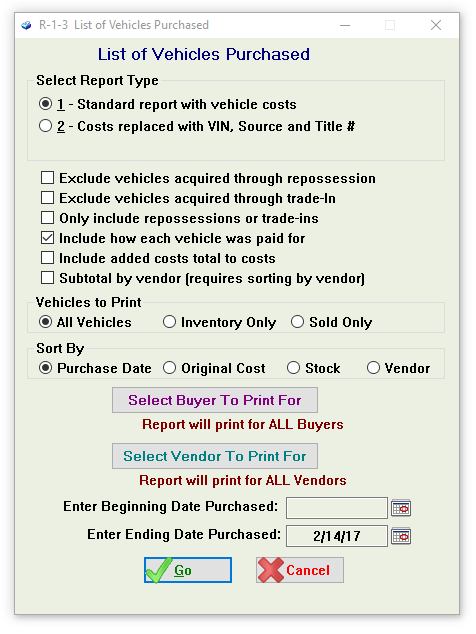 Select the standard report, type 1, for All vehicles, All buyers and vendors. Run it from a blank date (that's right, blank) to the current date. Make sure you check the box to Include how each vehicle was paid for. This report will help you get your inventory vehicles up to speed. 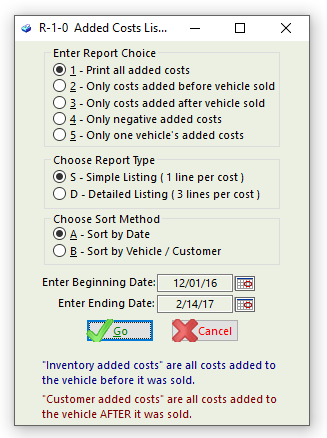 Go down the report, make sure that the list matches your current lot’s inventory, and that all dates, vehicle costs, how those costs were paid and their added costs totals are completely correct. It will also help you verify your existing floor plans, and make sure that any open floor plans on the report, are still actually open. 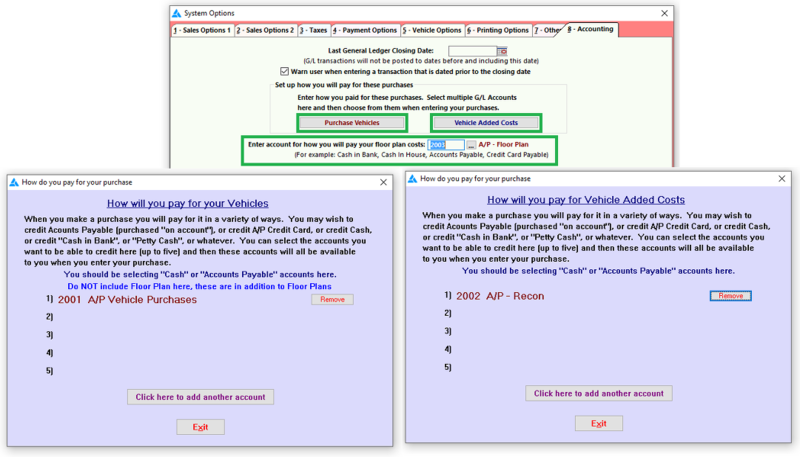 - Remember, you should use G/L Accounts 2001 for vehicles, and 2003 for Floor Plans. 4. Were any of these vehicles floor planned? Is that information correct? B. Print R-1-0-S Added Costs Listing. This report will show an added cost detail. It includes every added cost you've entered and will allow you to verify each one's specific date, vendor, amount and account used to pay for it. All of this needs to be verified, and corrected if needed. - Remember - you should be using G/L Account 2002 for Added Costs/Reconditioning. Important : If you completed step 4, you can skip this step and move on to step 6. Once you complete the above steps, it's time to give us a call at 888-963-5369, to continue your Accounting Setup. An Accounting Specialist will help you complete the process. They’ll go through existing customers and how to do more advanced things in the software. From there, the accounting team will verify your General Ledger account balances and assist in your first bank reconciliation. To learn more, watch the video tutorials below! Buy Here Pay Here and Outside Finance Sales - How to Process in-house and outside financed deals (with outside lenders).